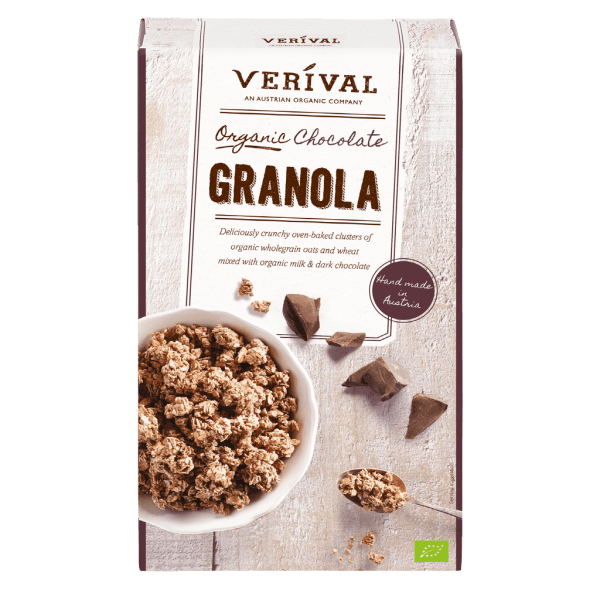 Deliciously crunchy oven-baked clusters of wholegrain oats and wheat with milk and dark chocolate. Mixed to perfection in the Austrian Tyrol to a traditional recipe. Very berry & purely organic. Guten Morgen! Wholegrain oat flakes*, cane sugar*, wholegrain wheat flakes*, high-oleic sunflower oil*, milk chocolate* 3,3% (sugar*, milk powder*, cocoa paste*, cocoa butter*, sweet whey powder* (milk), emulsifier: sunflower lecithin*), dark chocolate* 1,8% (cocoa paste*, sugar*, cocoa butter*, emulsifier: sunflower lecithin*), wholegrain crisped rice*, cocoa powder* 1,3%, coconut shreds*, salt.